A function to compute this Gaussian for arbitrary and is also available ( gauss_spline ). 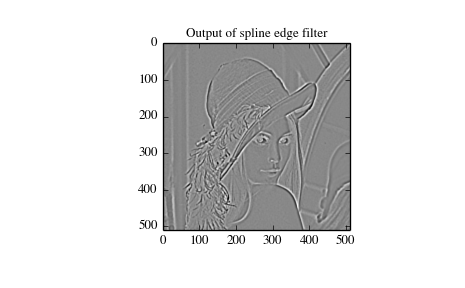 The following code and Figure uses spline-filtering to compute an edge-image (the second-derivative of a smoothed spline) of Lena’s face which is an array returned by the command misc.lena. The command sepfir2d was used to apply a separable two-dimensional FIR filter with mirror- symmetric boundary conditions to the spline coefficients. This function is ideally suited for reconstructing samples from spline coefficients and is faster than convolve2d which convolves arbitrary two-dimensional filters and allows for choosing mirror-symmetric boundary conditions. One dimensional convolution is implemented in SciPy with the function convolve. This function takes as inputs the signals , and an optional flag and returns the signal The optional flag allows for specification of which part of the output signal to return. The default value of ‘full’ returns the entire signal. If the flag has a value of ‘same’ then only the middle values are returned starting at so that the output has the same length as the largest input. If the flag has a value of ‘valid’ then only the middle output values are returned where depends on all of the values of the smallest input from to In other words only the values to inclusive are returned. This same function convolve can actually take -dimensional arrays as inputs and will return the -dimensional convolution of the two arrays as is shown in the code example below. The same input flags are available for that case as well. The SciPy function correlate implements this operation. Equivalent flags are available for this operation to return the full length sequence (‘full’) or a sequence with the same size as the largest sequence starting at (‘same’) or a sequence where the values depend on all the values of the smallest sequence (‘valid’). This final option returns the values to inclusive. The function correlate can also take arbitrary -dimensional arrays as input and return the -dimensional convolution of the two arrays on output. 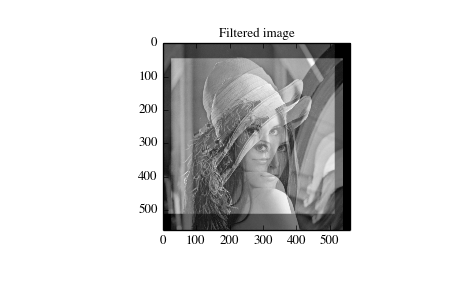 When correlate and/or convolve can be used to construct arbitrary image filters to perform actions such as blurring, enhancing, and edge-detection for an image. Using convolve in the above example would take quite long to run. Calculating the convolution in the time domain as above is mainly used for filtering when one of the signals is much smaller than the other ( ), otherwise linear filtering is more efficiently calculated in the frequency domain provided by the function fftconvolve. which is often used for blurring. 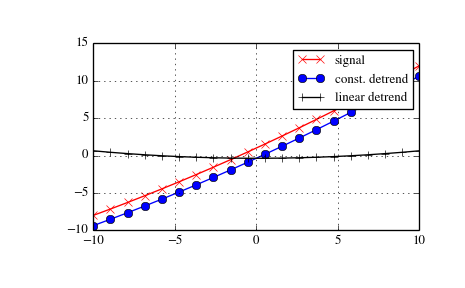 The difference-equation filter is called using the command lfilter in SciPy. This command takes as inputs the vector the vector, a signal and returns the vector (the same length as ) computed using the equation given above. If is -dimensional, then the filter is computed along the axis provided. 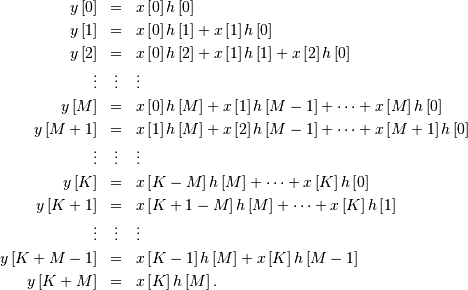 If, desired, initial conditions providing the values of to can be provided or else it will be assumed that they are all zero. 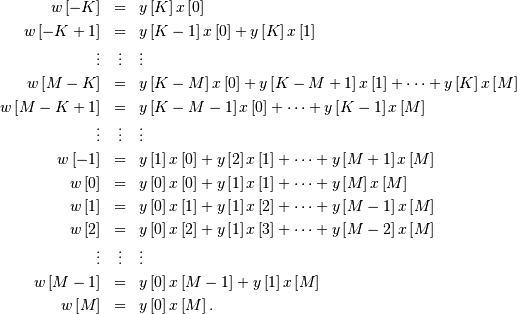 If initial conditions are provided, then the final conditions on the intermediate variables are also returned. These could be used, for example, to restart the calculation in the same state. 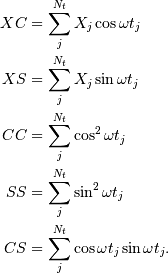 Using this formula we can find the initial condition vector to given initial conditions on (and ). The command lfiltic performs this function. The code calculates the signal for a given signal ; first for initial condiditions (default case), then for by means of :fun:`lfiltic`. Note that the output signal has the same length as the length as the input signal . This alternative representation can be obtain wit hthe scipy function tf2zpk; the inverse is provided by zpk2tf. i.e. the system has a zero at and a pole at . 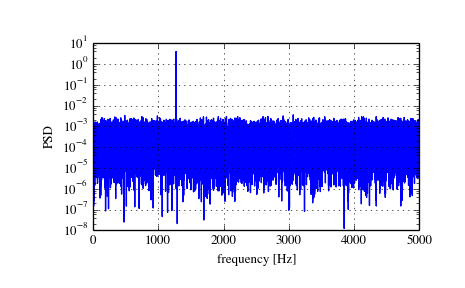 The scipy function freqz allows calculation of the frequency response of a system described by the coeffcients and . See the help of the freqz function of a comprehensive example. Time-discrete filters can be classified into finite response (FIR) filters and infinite response (IIR) filters. FIR filters provide a linear phase response, whereas IIR filters do not exhibit this behaviour. 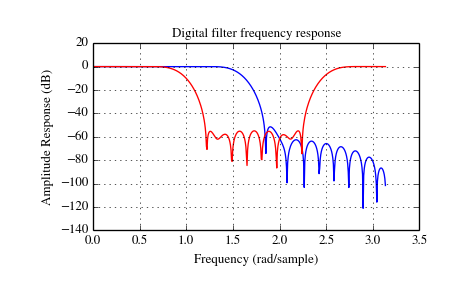 Scipy provides functions for designing both types of filters. The function firwin designs filters according to the window method. Depending on the provided arguments, the function returns different filter types (e.g. low-pass, band-pass...). The example below designs a low-pass and a band-stop filter, respectively. Note that firwin uses per default a normalized frequency defined such that the value corresponds to the Nyquist frequency, whereas the function freqz is defined such that the value corresponds to the Nyquist frequency. The function firwin2 allows design of almost arbitrary frequency responses by specifying an array of corner frequencies and corresponding gains, respectively. 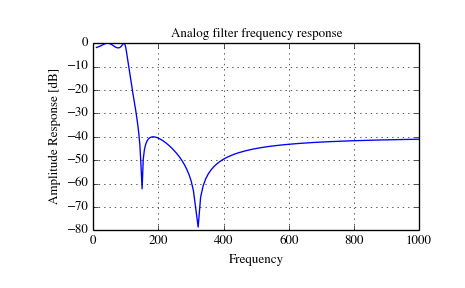 The example below designs a filter with such an arbitrary amplitude response. Note the linear scaling of the y-axis and the different definition of the Nyquist frequency in firwin2 and freqz (as explained above). 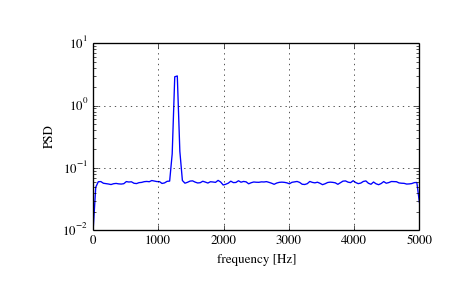 Scipy provides two functions to directly design IIR iirdesign and iirfilter where the filter type (e.g. elliptic) is passed as an argument and several more filter design functions for specific filter types; e.g. ellip. The example below designs an elliptic low-pass filter with defined passband and stopband ripple, respectively. Note the much lower filter order (order 4) compared with the FIR filters from the examples above in order to reach the same stop-band attenuation of dB. 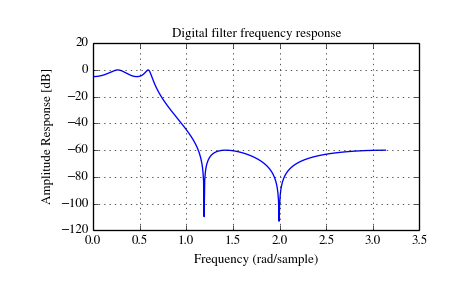 A median filter is commonly applied when noise is markedly non-Gaussian or when it is desired to preserve edges. The median filter works by sorting all of the array pixel values in a rectangular region surrounding the point of interest. The sample median of this list of neighborhood pixel values is used as the value for the output array. The sample median is the middle array value in a sorted list of neighborhood values. If there are an even number of elements in the neighborhood, then the average of the middle two values is used as the median. A general purpose median filter that works on N-dimensional arrays is medfilt . A specialized version that works only for two-dimensional arrays is available as medfilt2d . 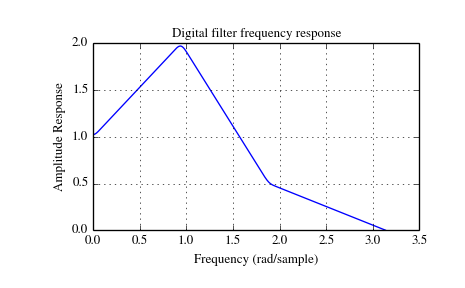 A median filter is a specific example of a more general class of filters called order filters. To compute the output at a particular pixel, all order filters use the array values in a region surrounding that pixel. These array values are sorted and then one of them is selected as the output value. For the median filter, the sample median of the list of array values is used as the output. A general order filter allows the user to select which of the sorted values will be used as the output. So, for example one could choose to pick the maximum in the list or the minimum. The order filter takes an additional argument besides the input array and the region mask that specifies which of the elements in the sorted list of neighbor array values should be used as the output. The command to perform an order filter is order_filter. The functions iirdesign, iirfilter, and the filter design functions for specific filter types (e.g. ellip) all have a flag analog which allows design of analog filters as well. 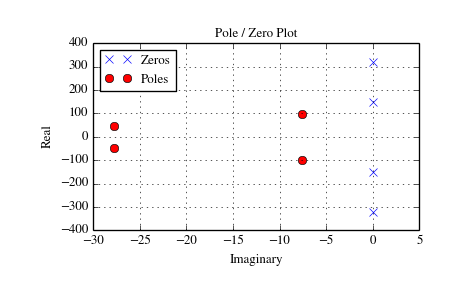 The example below designs an analog (IIR) filter, obtains via tf2zpk the poles and zeros and plots them in the complex s-plane. The zeros at and can be clearly seen in the amplitude response. The scipy function periodogram provides a method to estimate the spectral density using the periodogram method. The example below calculates the periodogram of a sine signal in white Gaussian noise. An improved method, especially with respect to noise immunity, is Welch’s method which is implemented by the scipy function welch. The example below estimates the spectrum using Welch’s method and uses the same parameters as the example above. Note the much smoother noise floor of the spectogram. Least-squares spectral analysis (LSSA) is a method of estimating a frequency spectrum, based on a least squares fit of sinusoids to data samples, similar to Fourier analysis. Fourier analysis, the most used spectral method in science, generally boosts long-periodic noise in long gapped records; LSSA mitigates such problems. The Lomb-Scargle method performs spectral analysis on unevenly sampled data and is known to be a powerful way to find, and test the significance of, weak periodic signals. The lombscargle function calculates the periodogram using a slightly modified algorithm due to Townsend  which allows the periodogram to be calculated using only a single pass through the input arrays for each frequency. This requires trigonometric function evaluations giving a factor of speed increase over the straightforward implementation. Scipy provides the function detrend to remove a constant or linear trend in a data series in order to see effect of higher order. The example below removes the constant and linear trend of a 2-nd order polynomial time series and plots the remaining signal components.